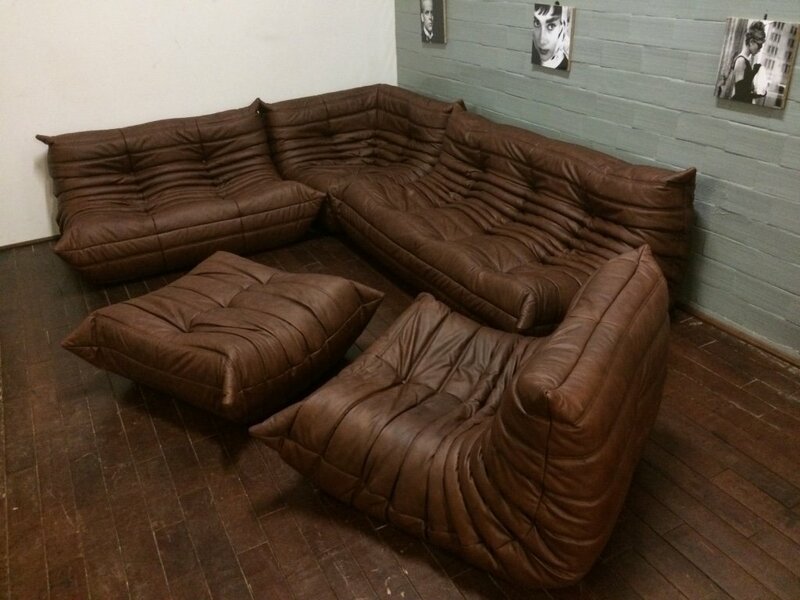 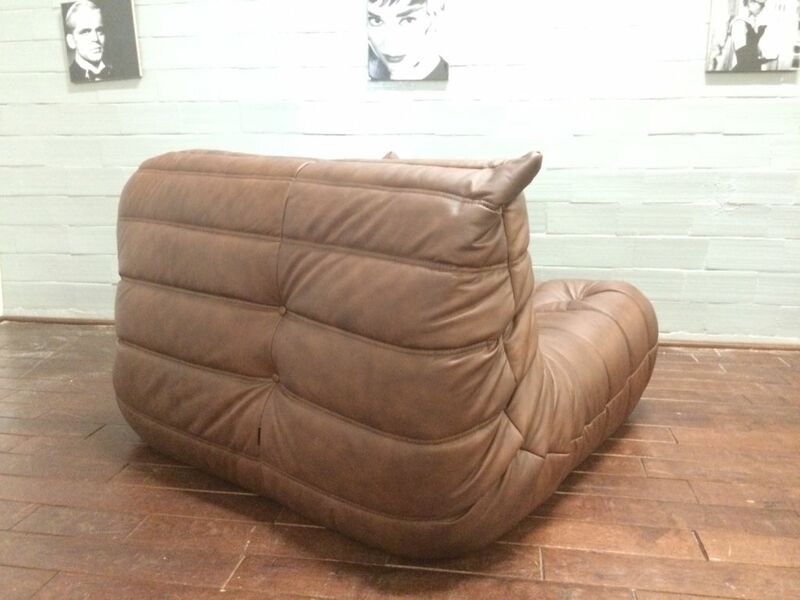 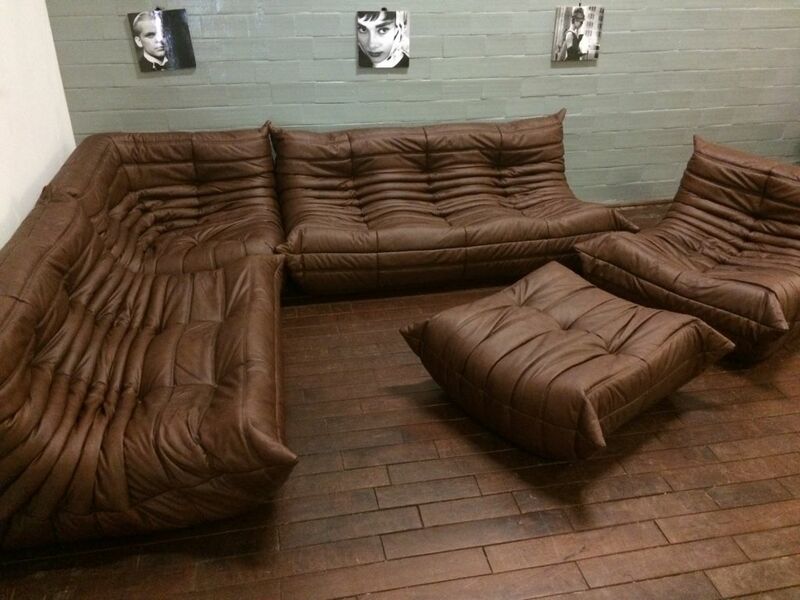 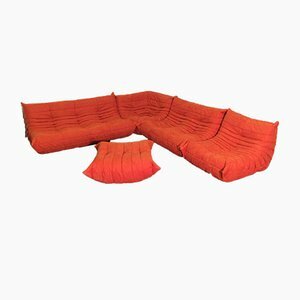 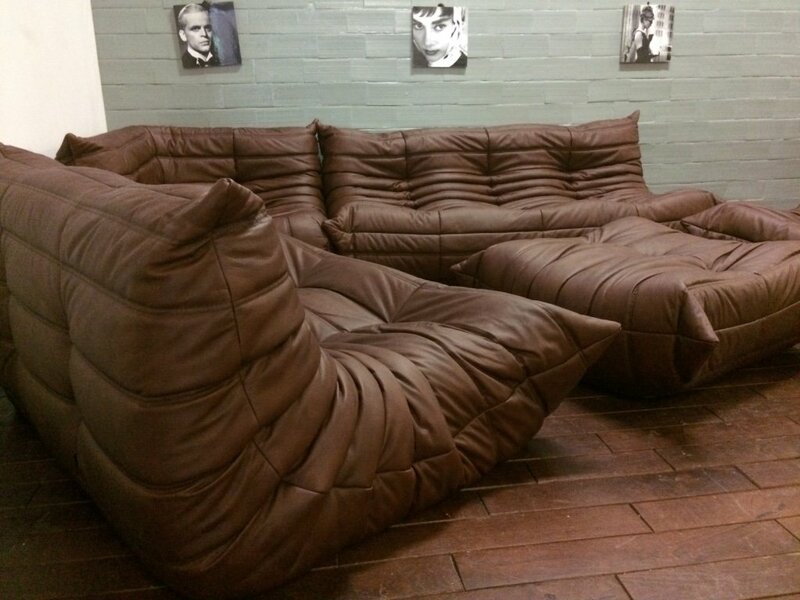 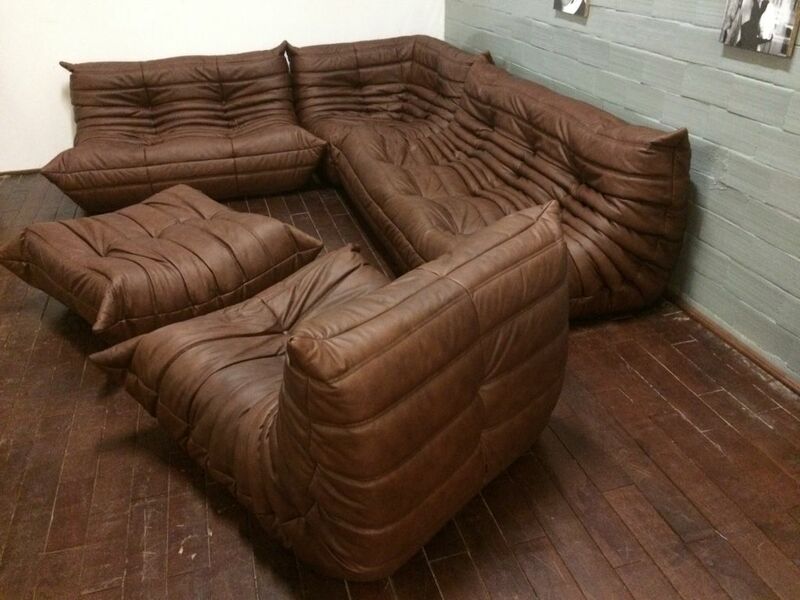 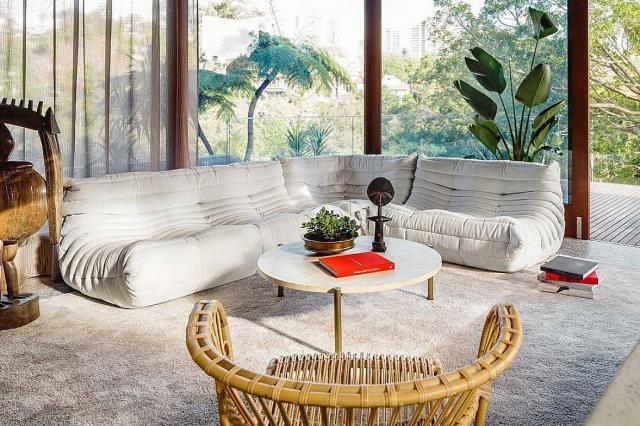 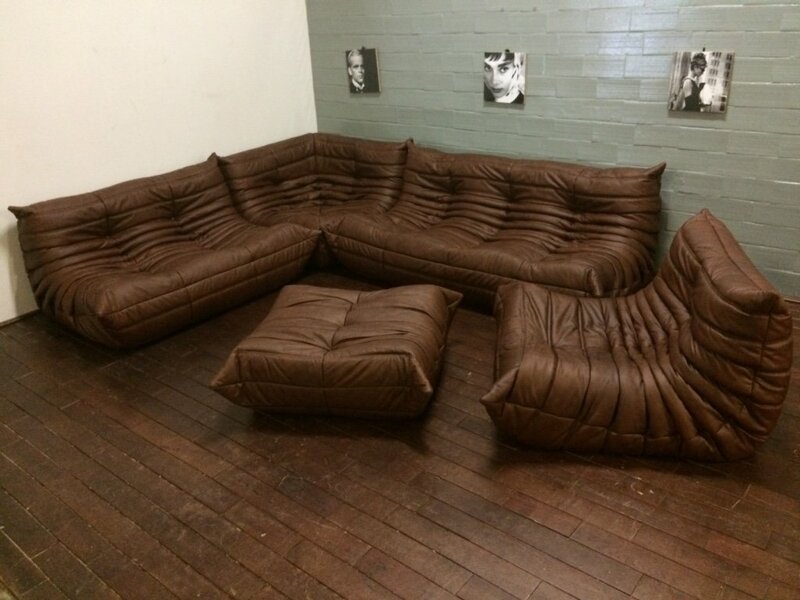 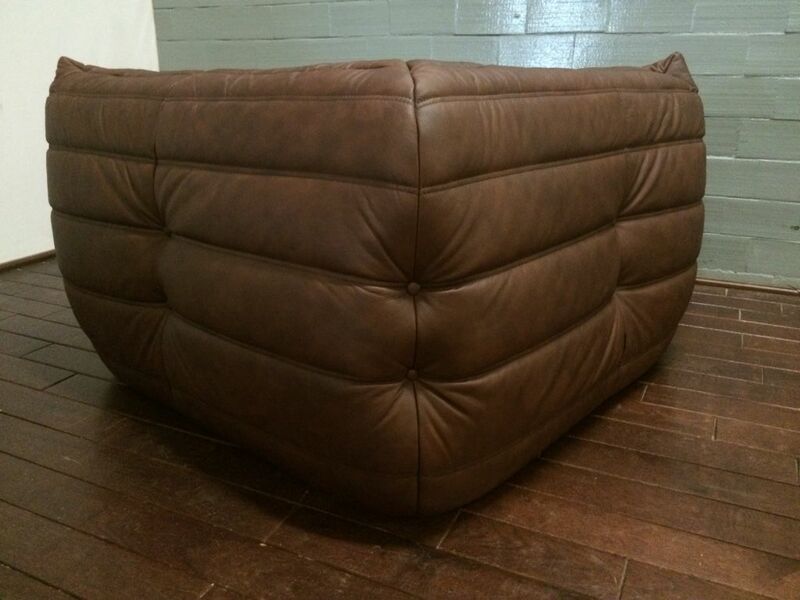 This Togo living room set was designed by Michel Ducaroy in 1974 and was manufactured by Ligne Roset in France. 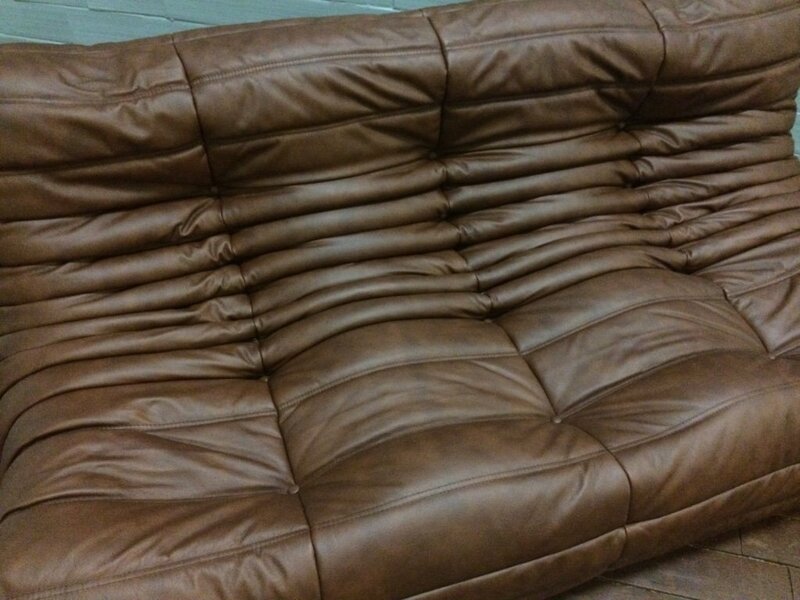 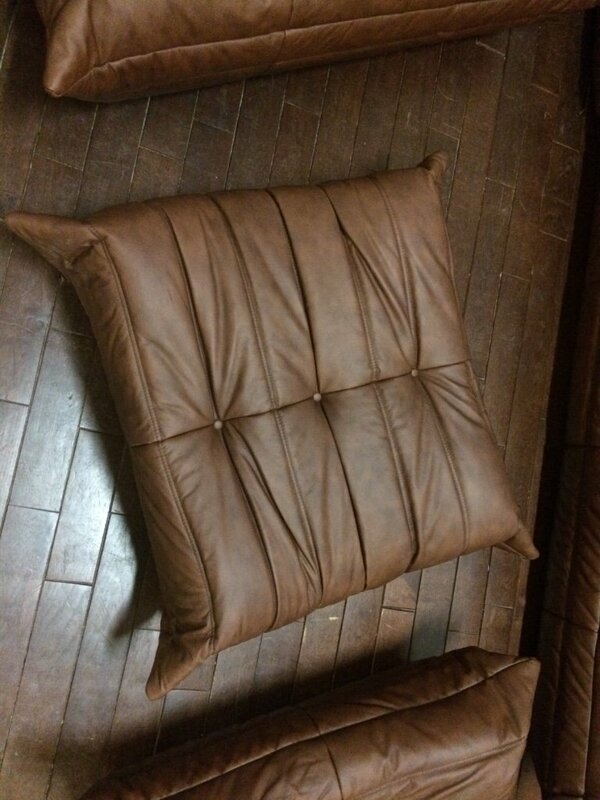 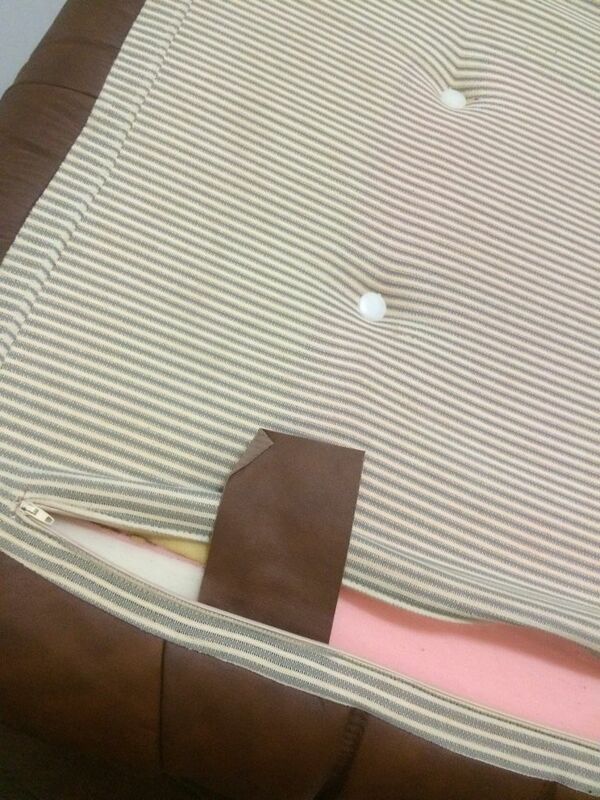 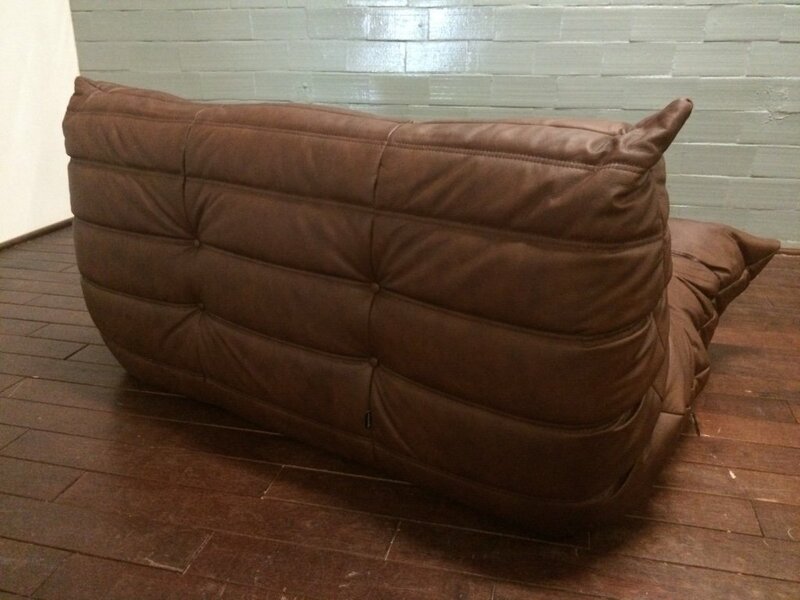 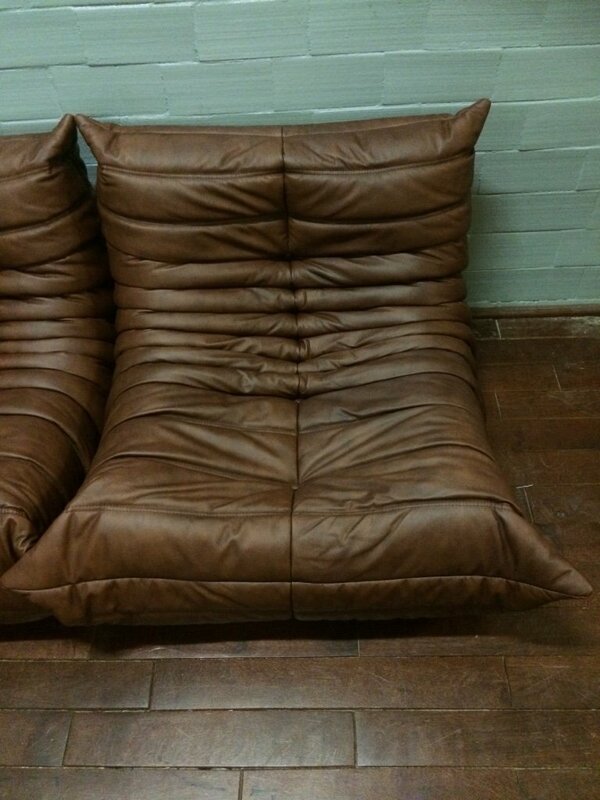 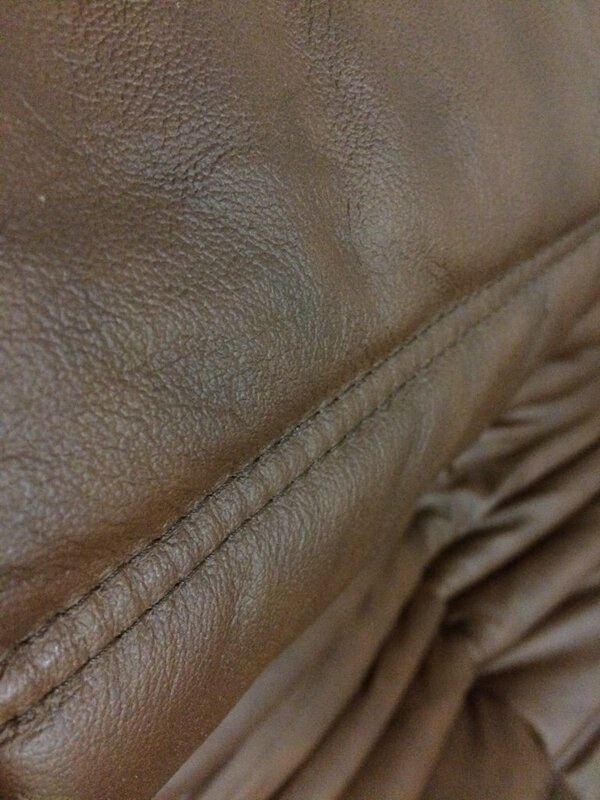 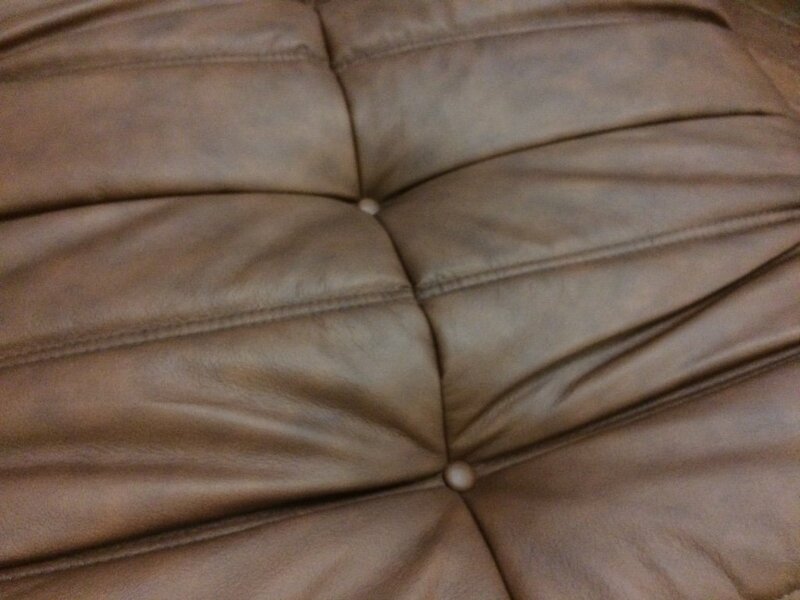 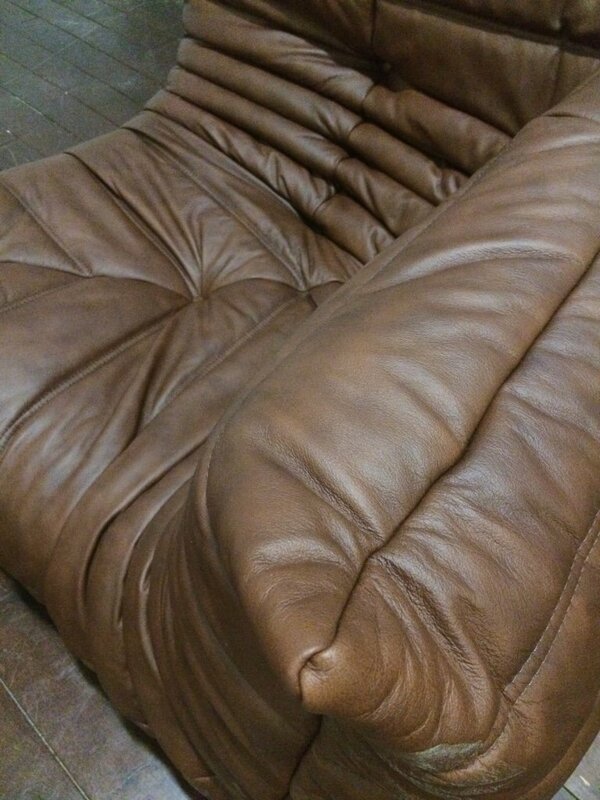 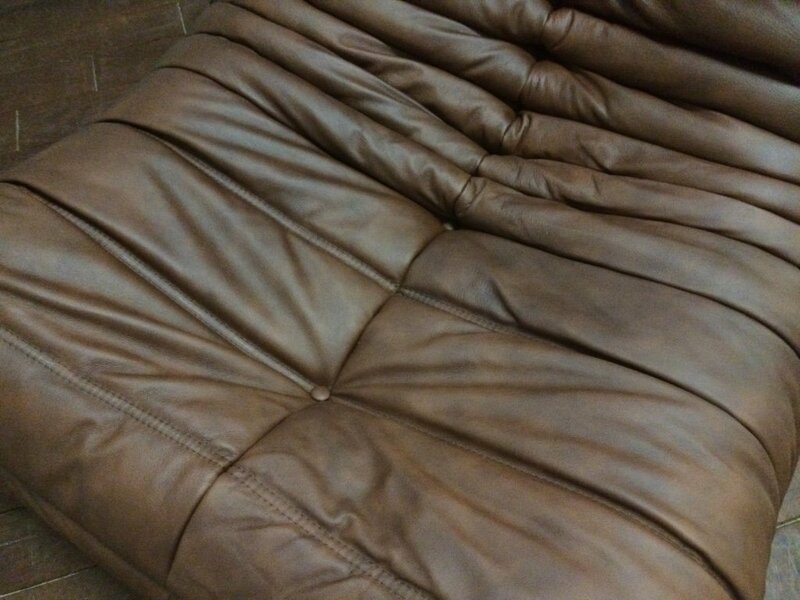 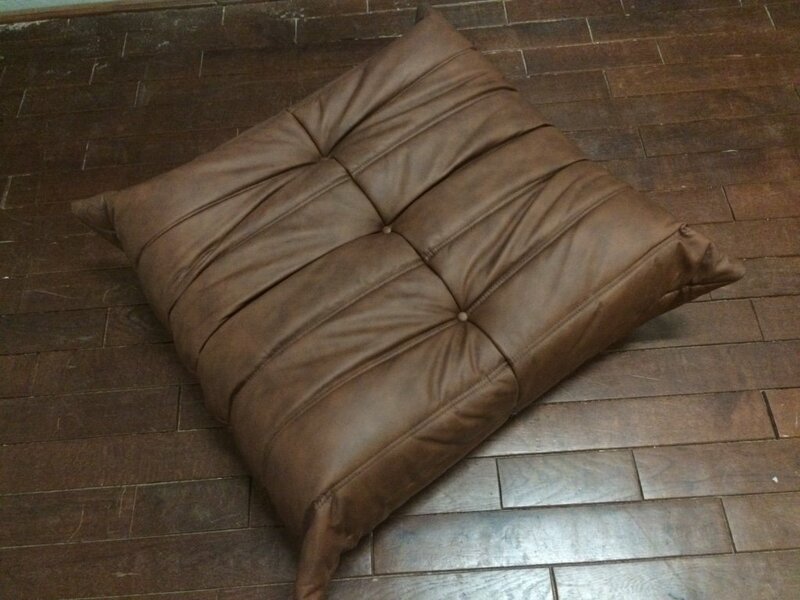 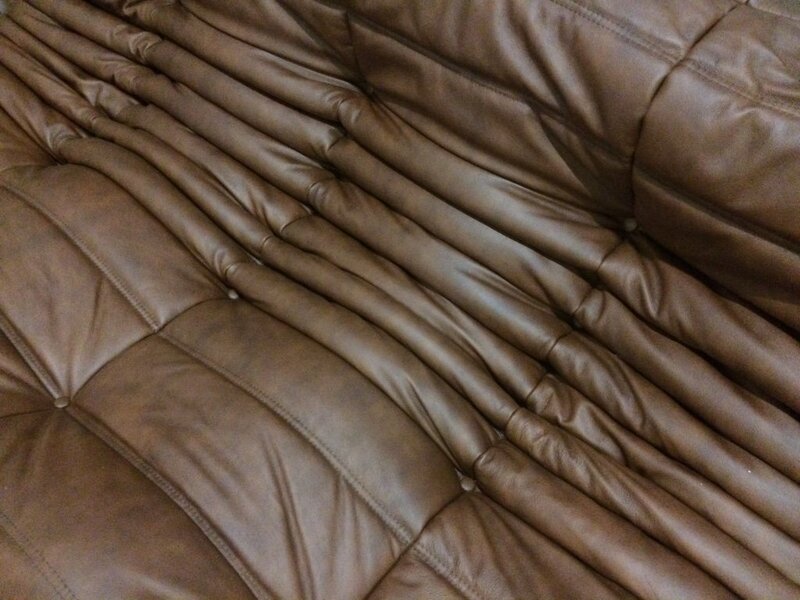 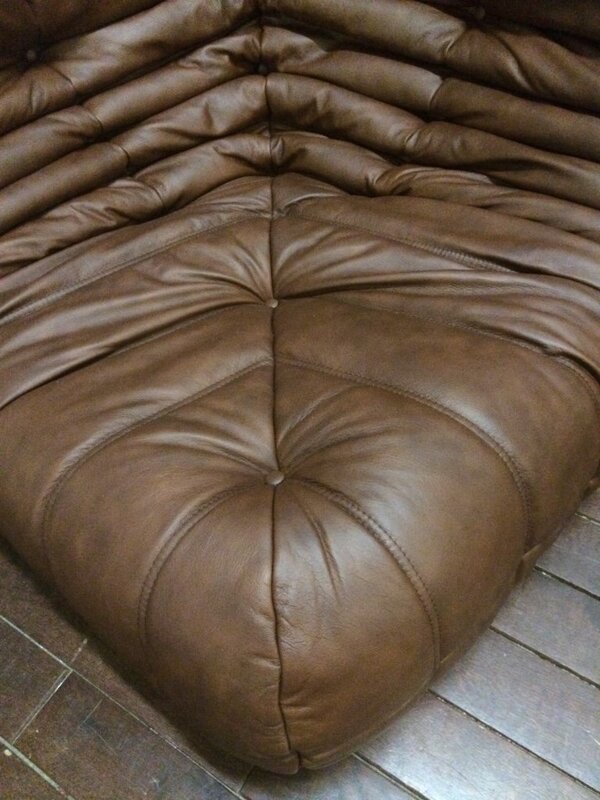 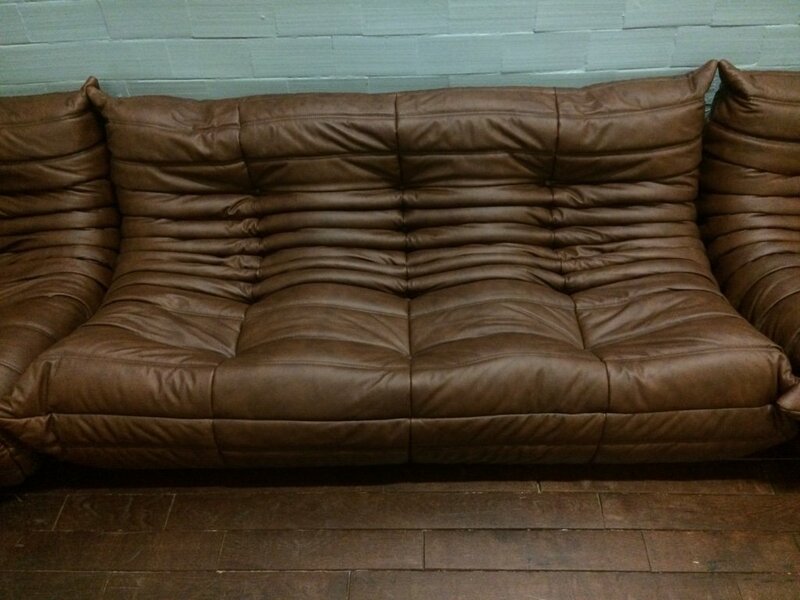 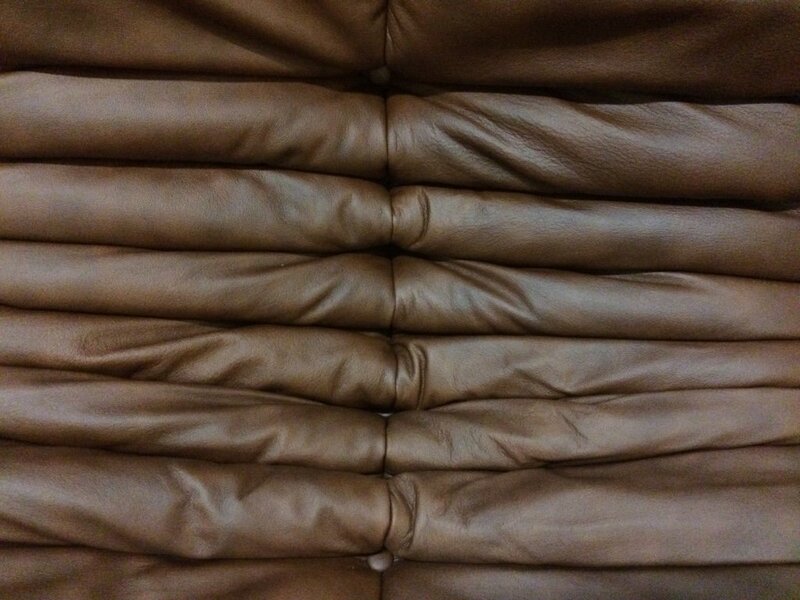 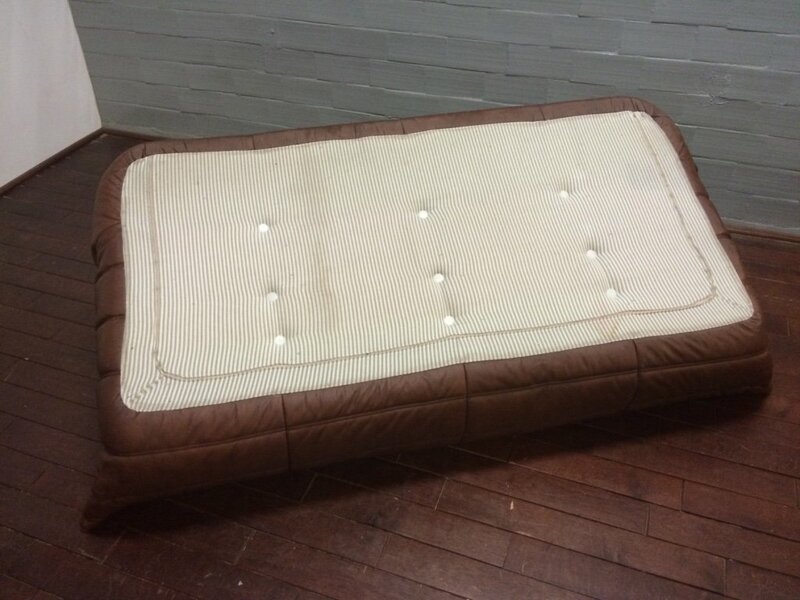 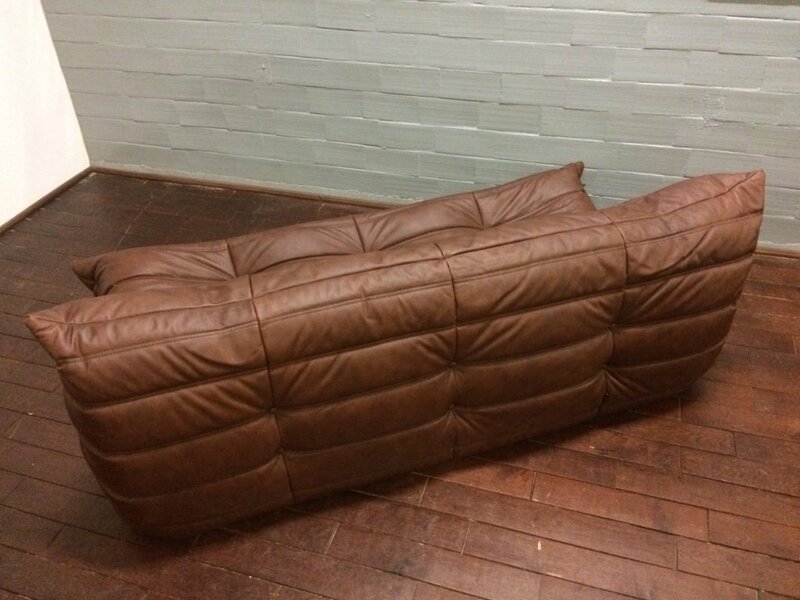 It has been reupholstered in genuine brown leather and consists of the following pieces: one three-seater couch (70 x 172 x 102 cm), one two-seater couch (70 x 131 x 102 cm), one corner couch (70 x 102 x 102 cm), one lounge chair (70 x 87 x 32 cm) and one pouf (30 x 87 x 102 cm). 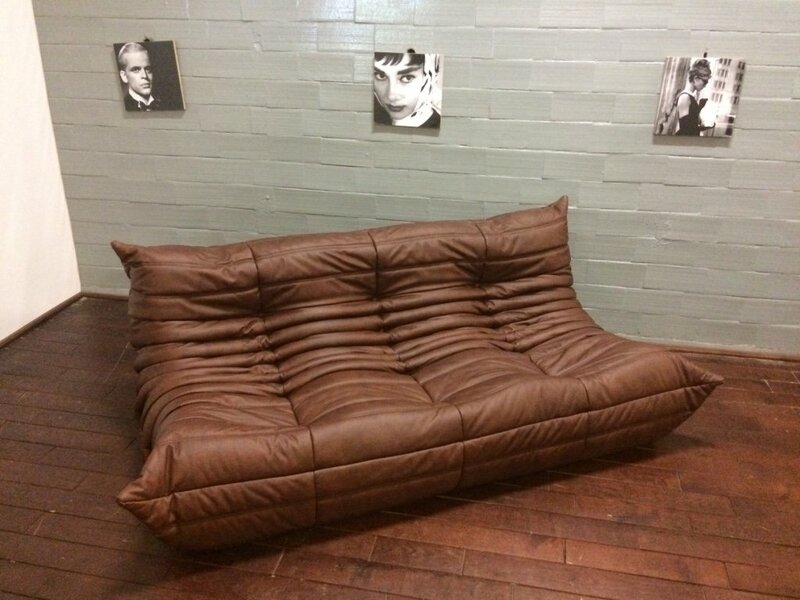 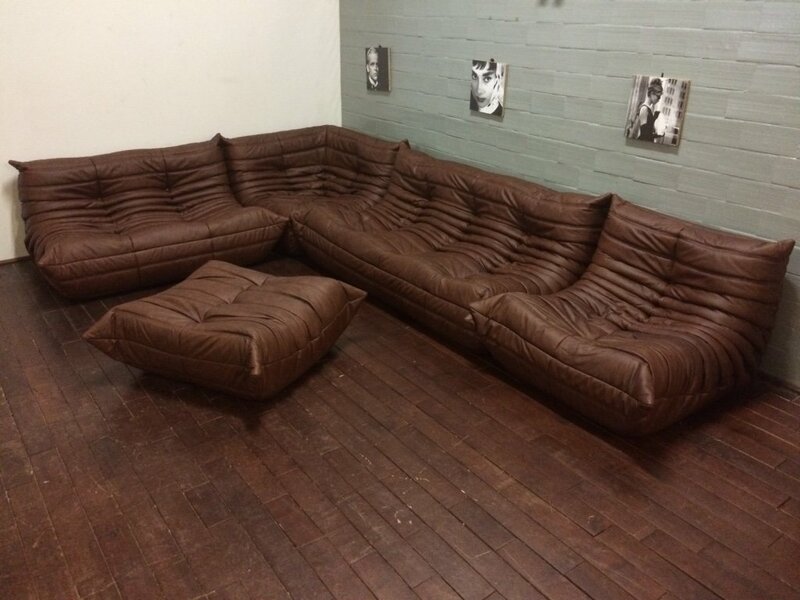 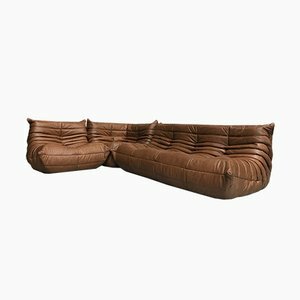 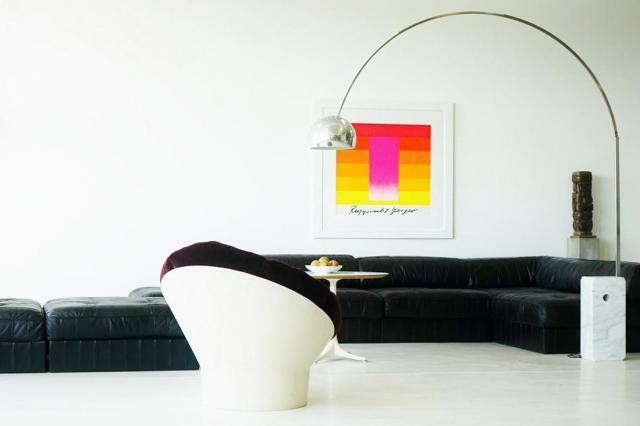 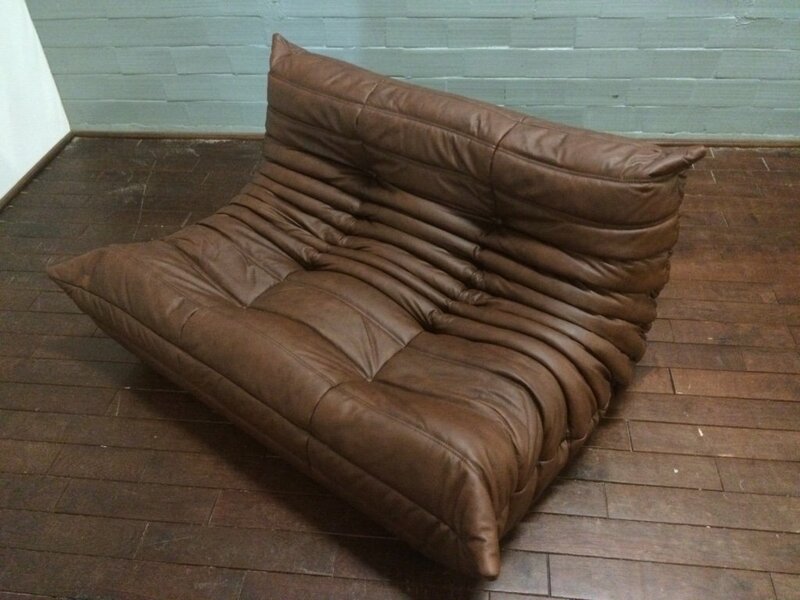 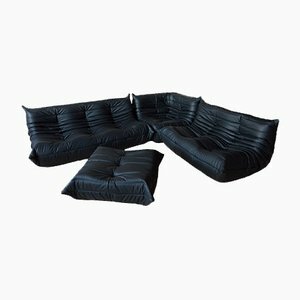 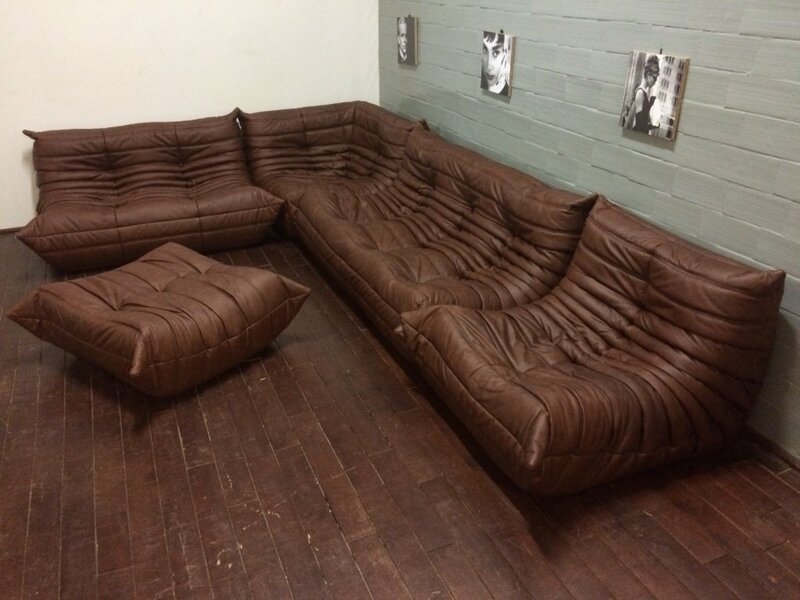 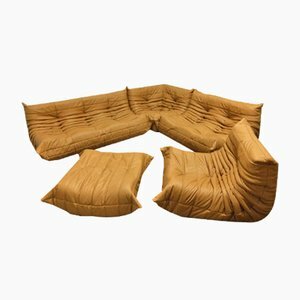 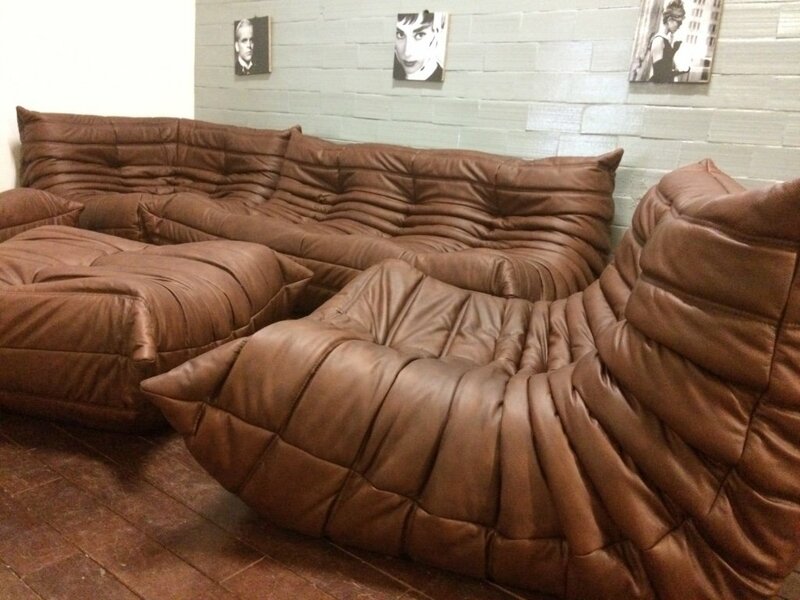 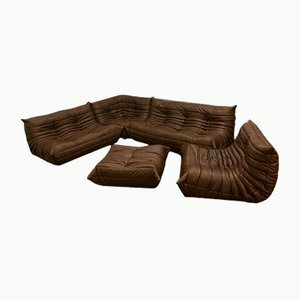 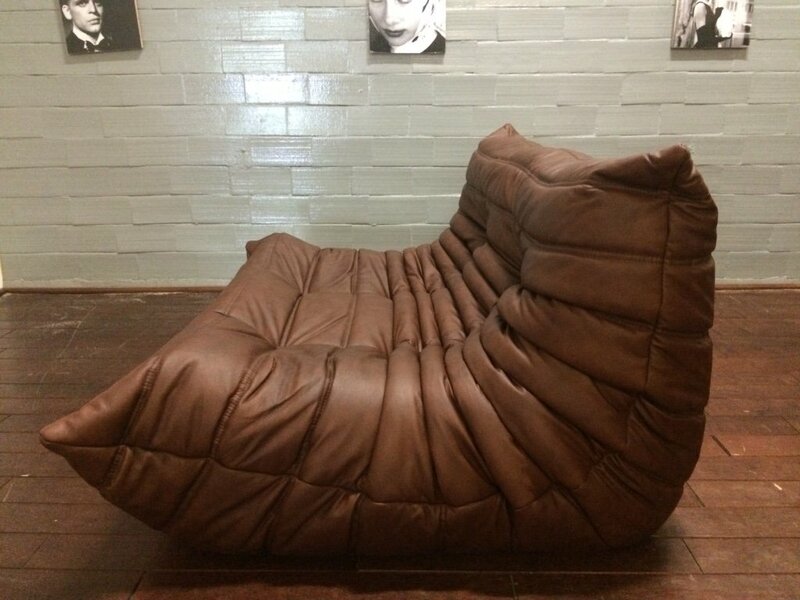 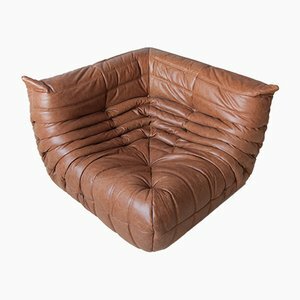 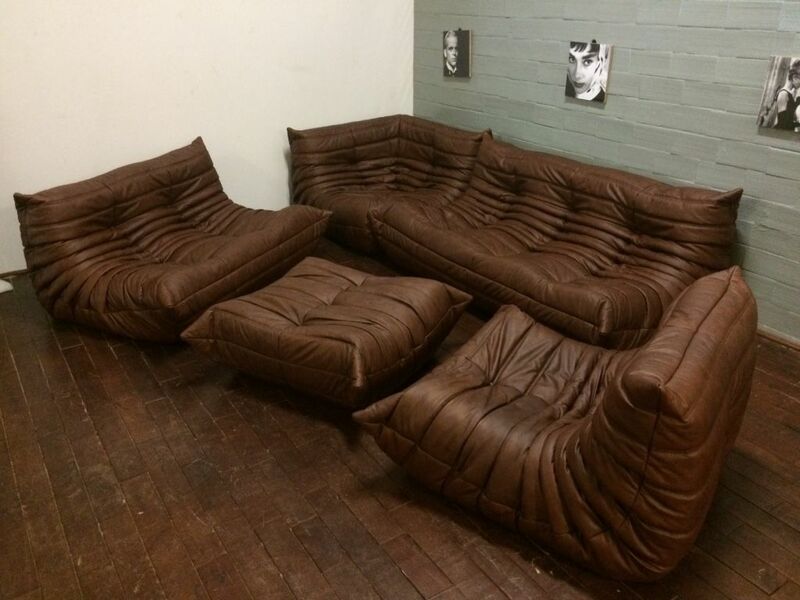 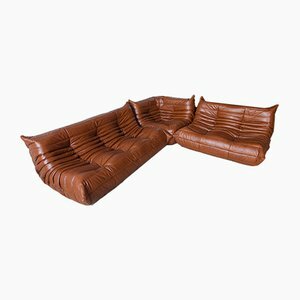 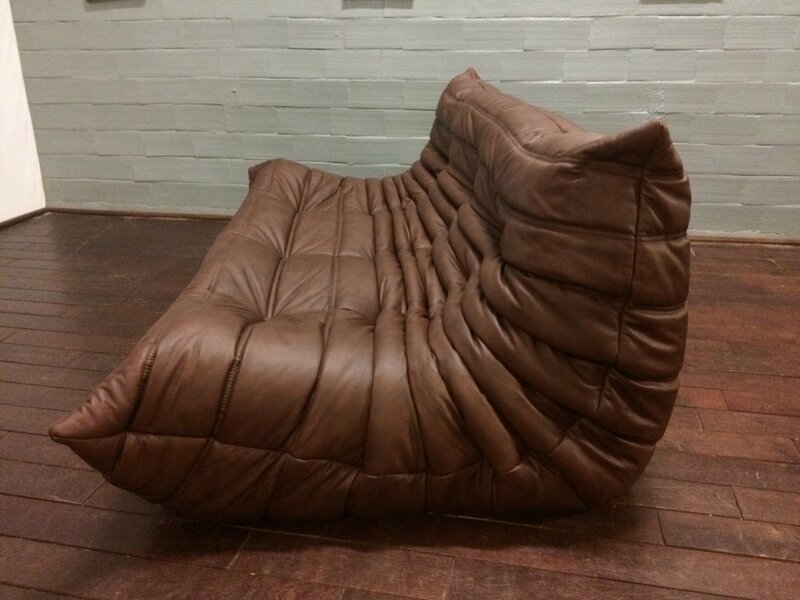 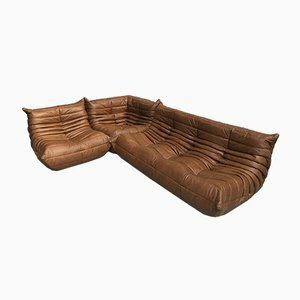 French seating designer Michel Ducaroy (1925-2009) is best known for his iconic, Pop Art-inspired Togo Sofa produced by high-end design brand Ligne Roset. 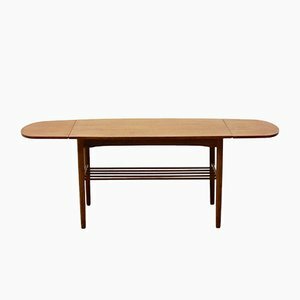 Ducaroy grew up surrounded by industrial design; his family owned a furniture factory that fitted the interiors of both private clients and ocean liners built at ports in Normandy. 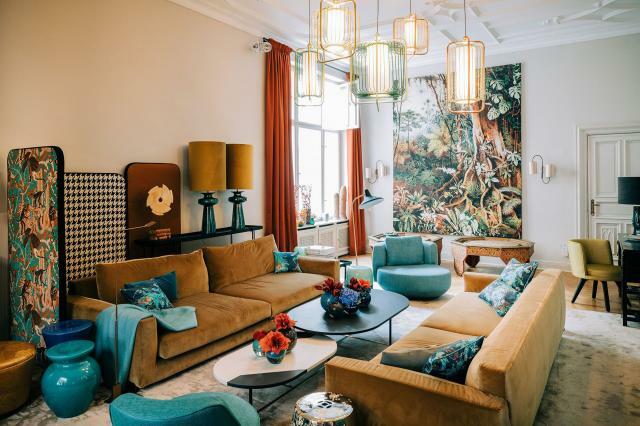 He studied sculpture at the École Supérieure Nationale des Beaux-Arts in Lyon—a specialization that can be seen in the distinctive silhouettes of Ducaroy’s later design work. 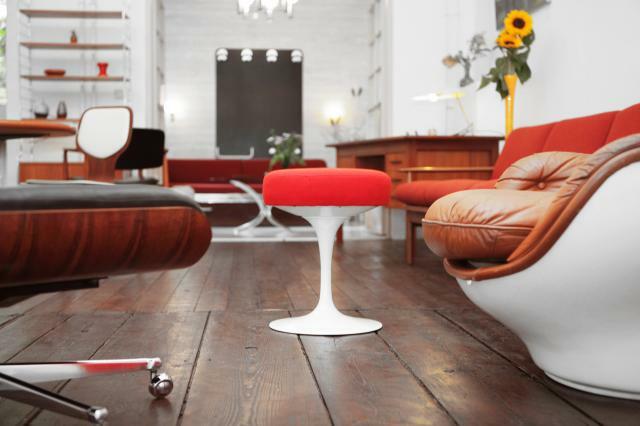 He launched his design studio in 1952. 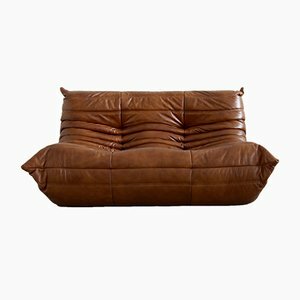 In 1954, Ducaroy began working with Ligne Roset, a family-run business dedicated to the production of traditional French, high-end seating. 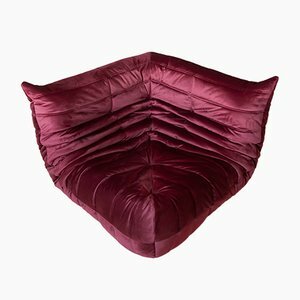 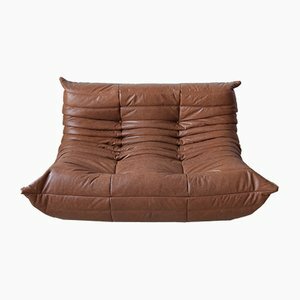 By the 1960s, he was one of the brand’s key designers, favoring biomorphic forms and high-tech synthetic materials like foam, thermoformed plastics, and quilted textiles. 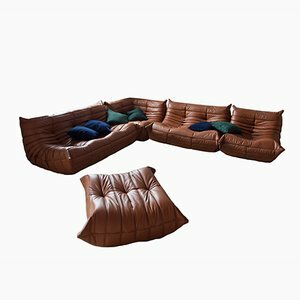 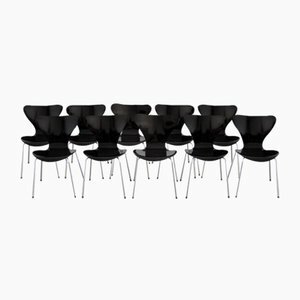 Some of his most successful Ligne Roset designs include the Adria, Kashima, Koufra, Safi, and Kali collections. 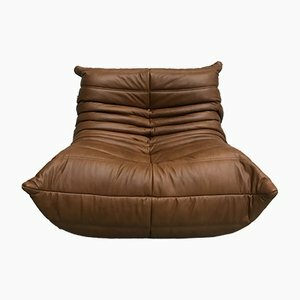 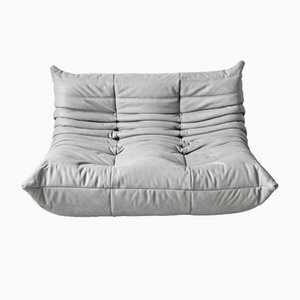 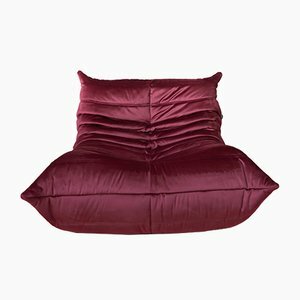 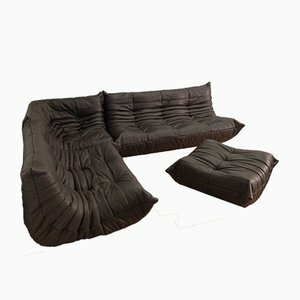 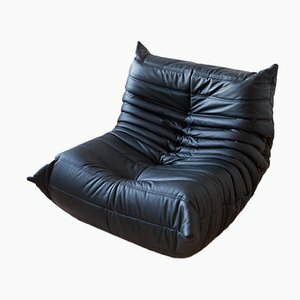 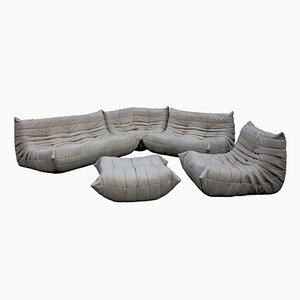 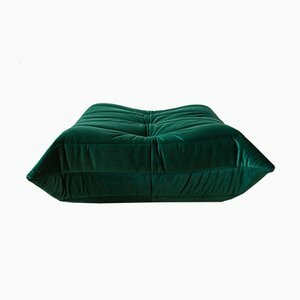 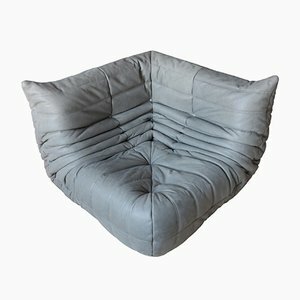 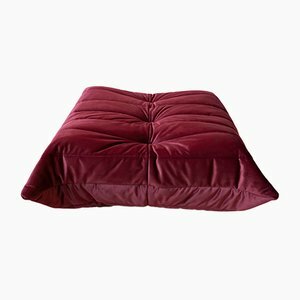 The pillow-like Togo, however, featuring a structure-less, foam-filled body, put Ducaroy and Ligne Roset on the international design map. 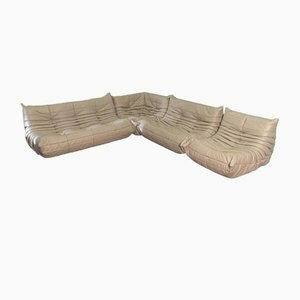 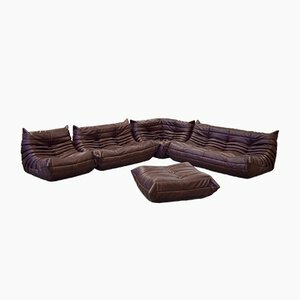 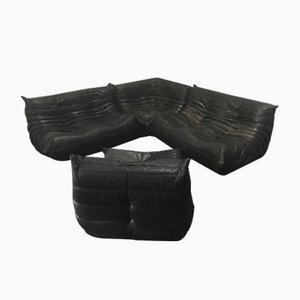 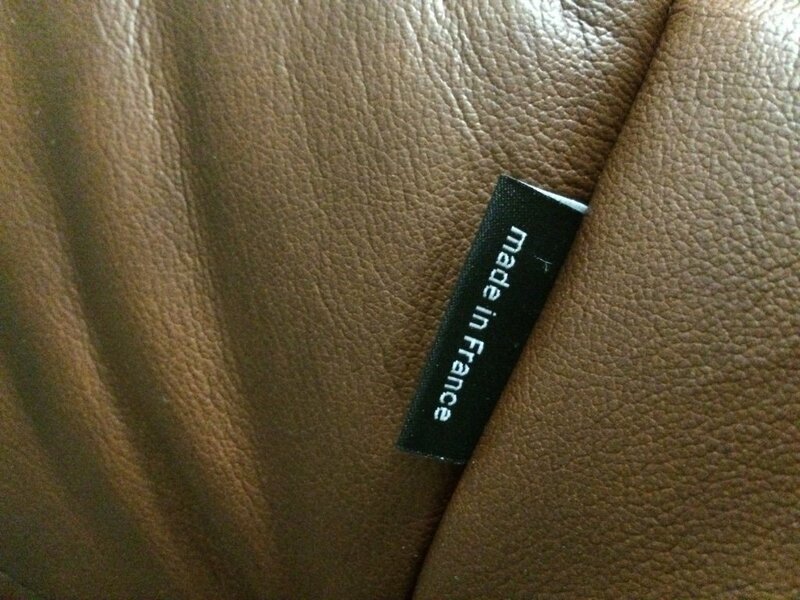 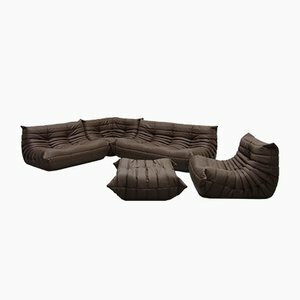 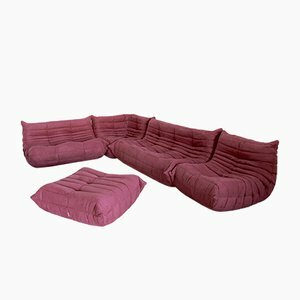 Launched at the 1973 at Salon des Arts Ménagers in Paris, Togo Sofas and Seats have since been sold to over a million consumers in more than 50 countries. 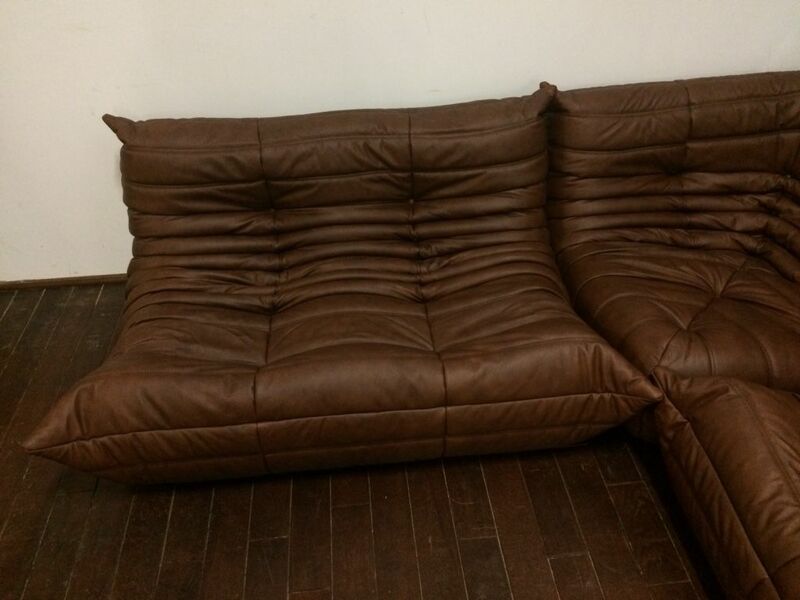 Ducaroy retired in the 1980s and passed away in Lyon in 2008. 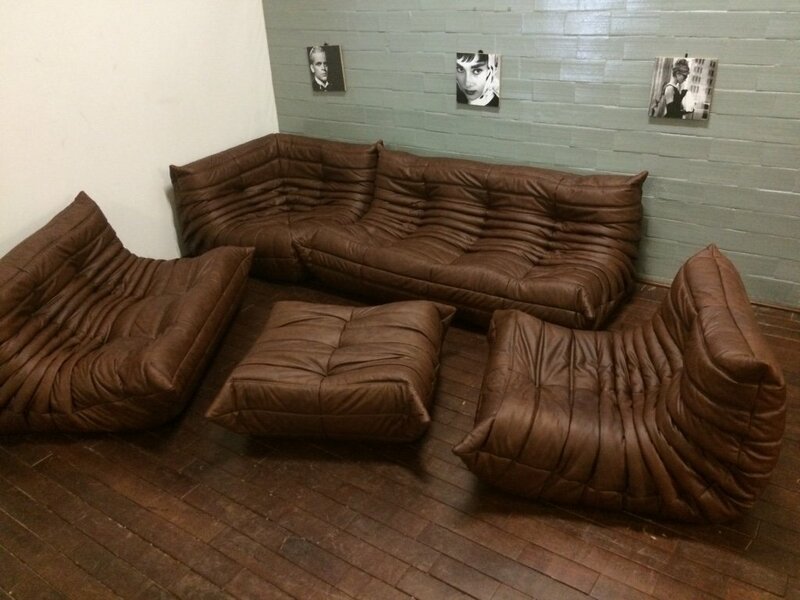 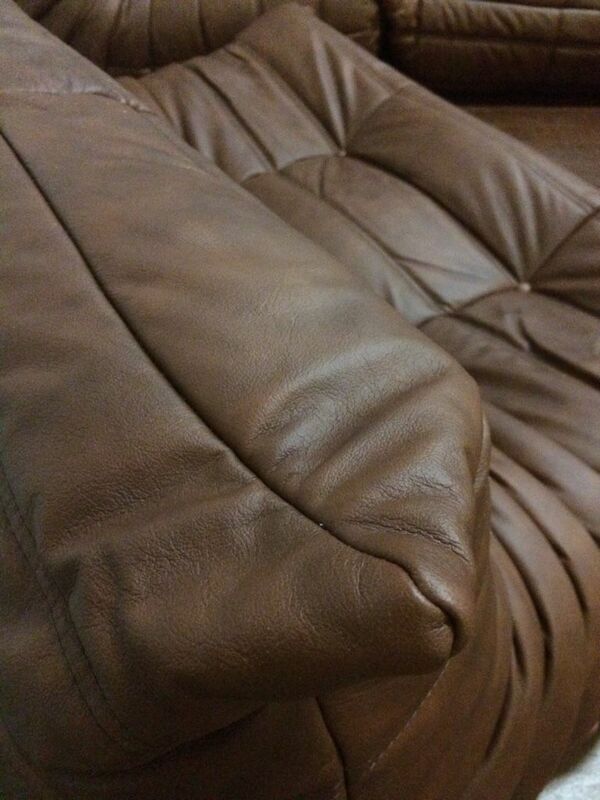 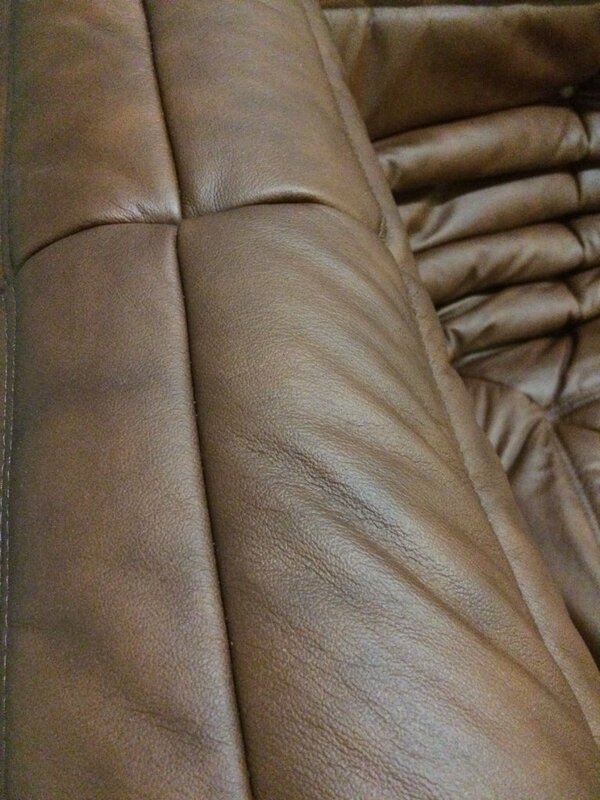 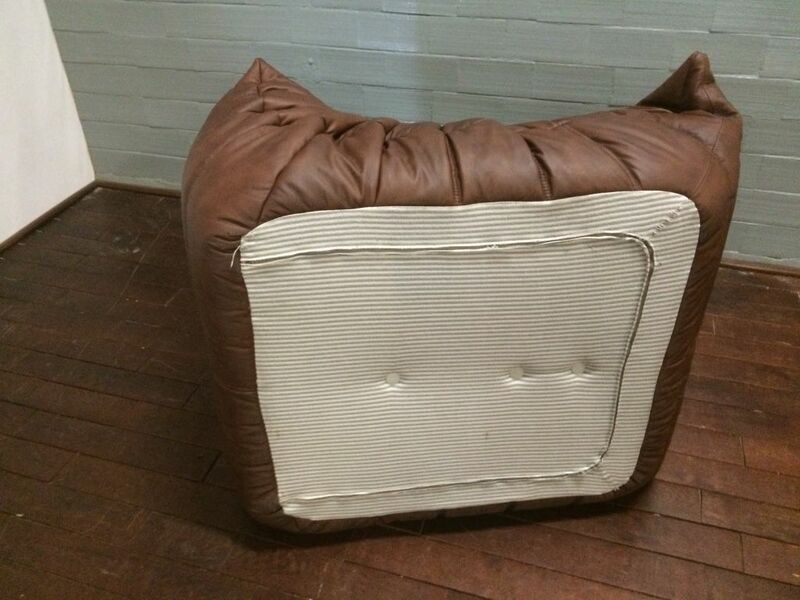 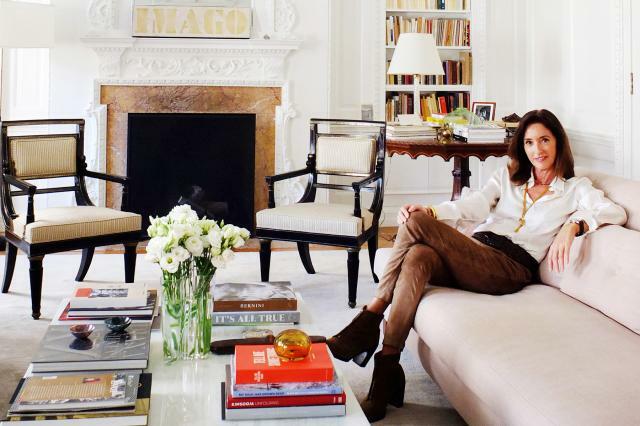 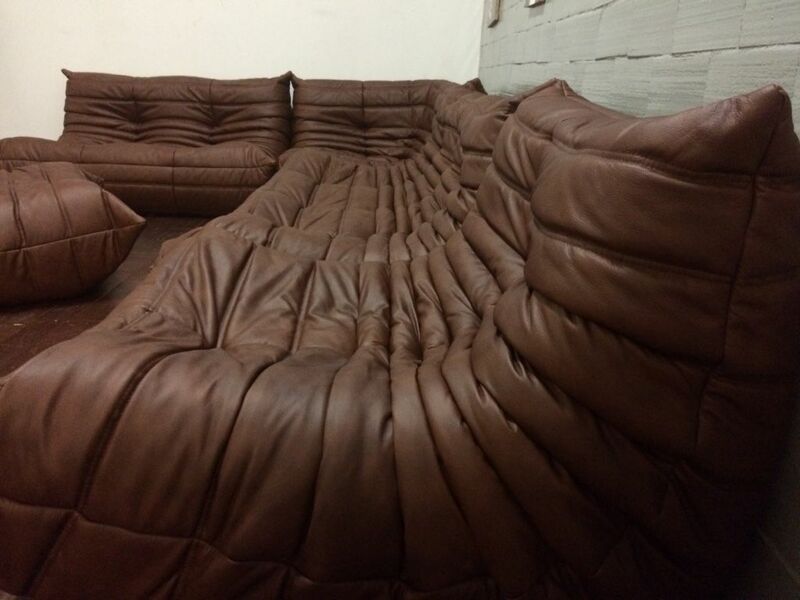 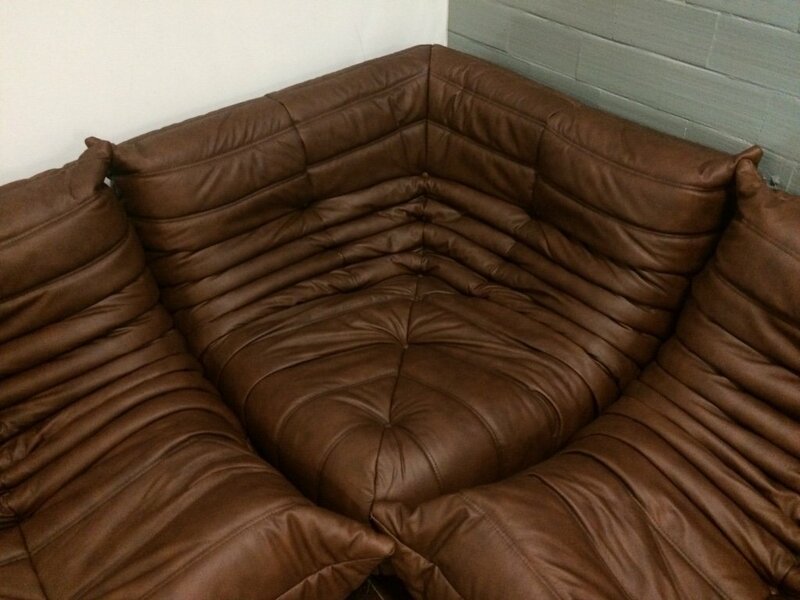 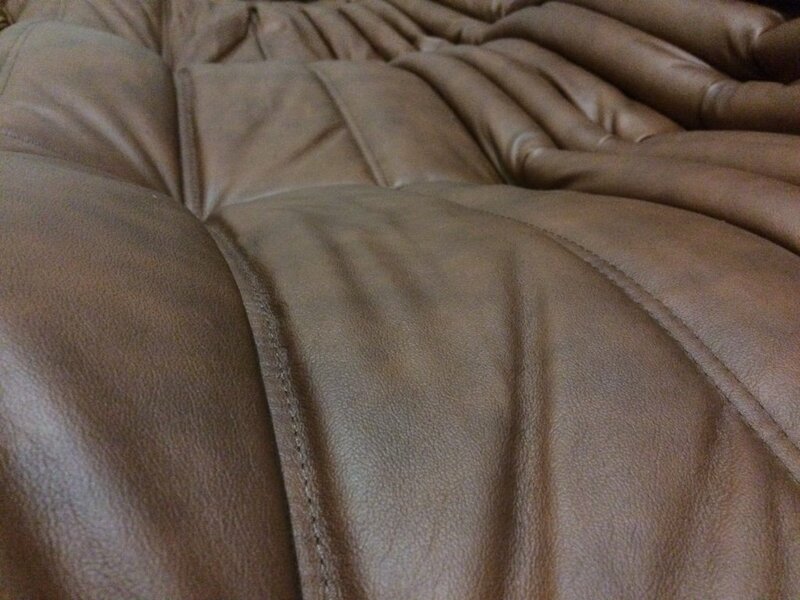 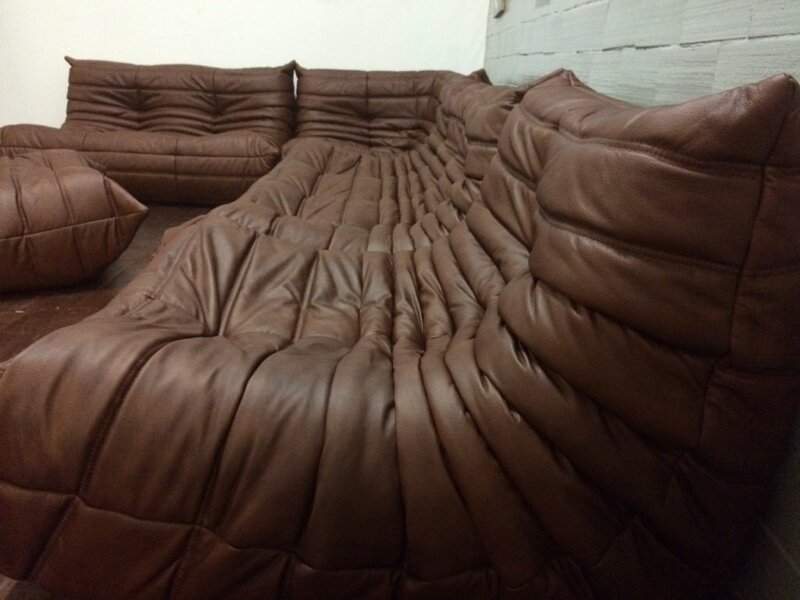 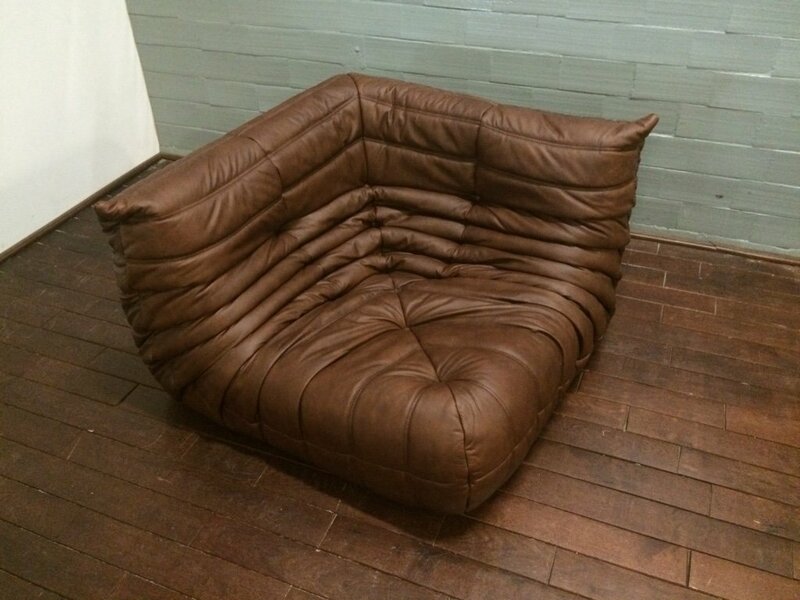 His iconic sofa is still in production today. 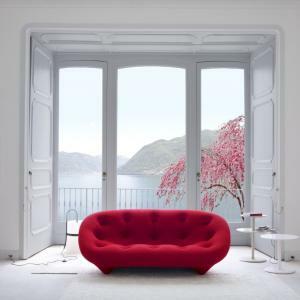 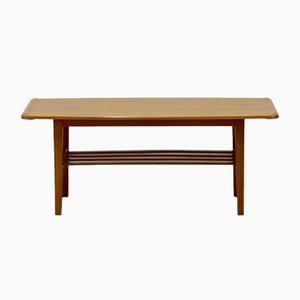 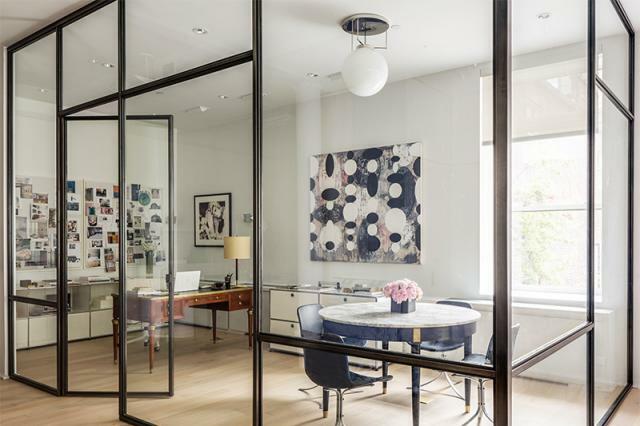 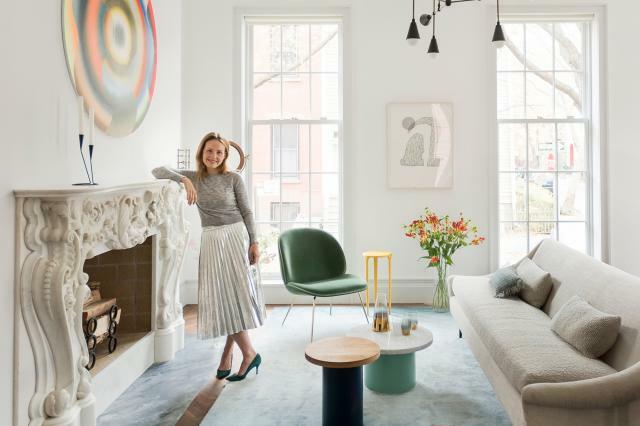 French high-end furniture company Ligne Roset began in 1860, when a young, former waiter, Antoine Roset (1841-1893), opened a woodworking workshop in a small village in the Ain region of eastern France. 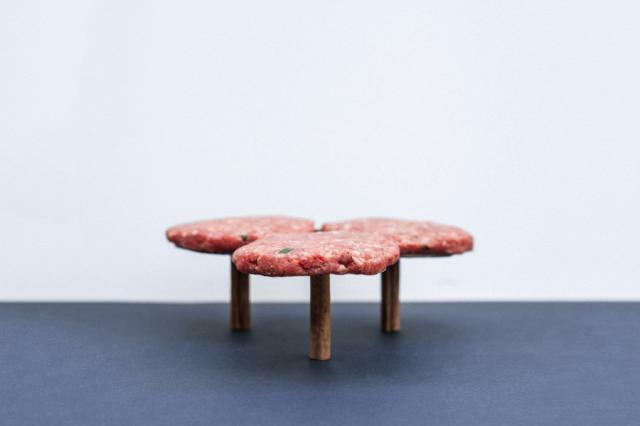 His company, Veuve A. Roset, specialized in walking sticks and, soon after, parasols. 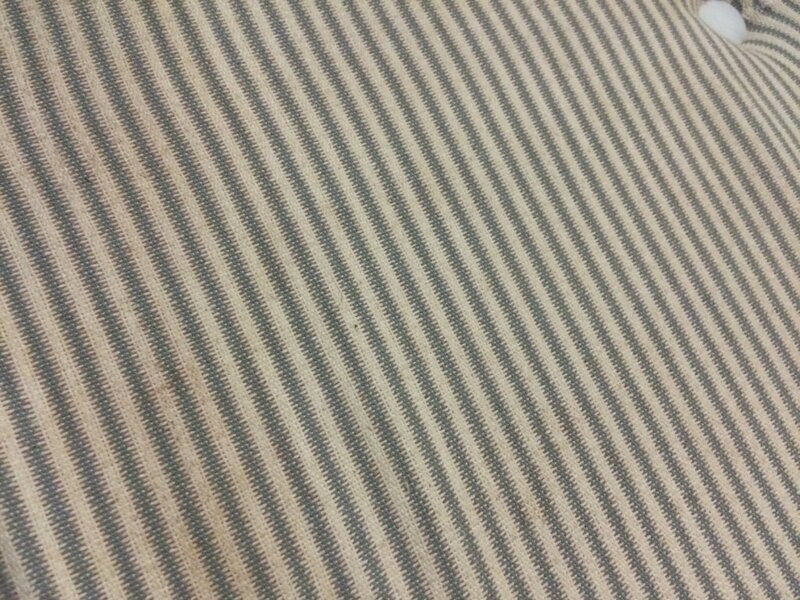 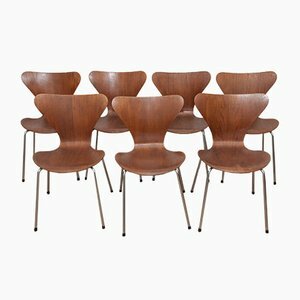 When the fashions changed toward the end of the 19th century, the company pivoted to focus on the production of frames for chairs and stools. 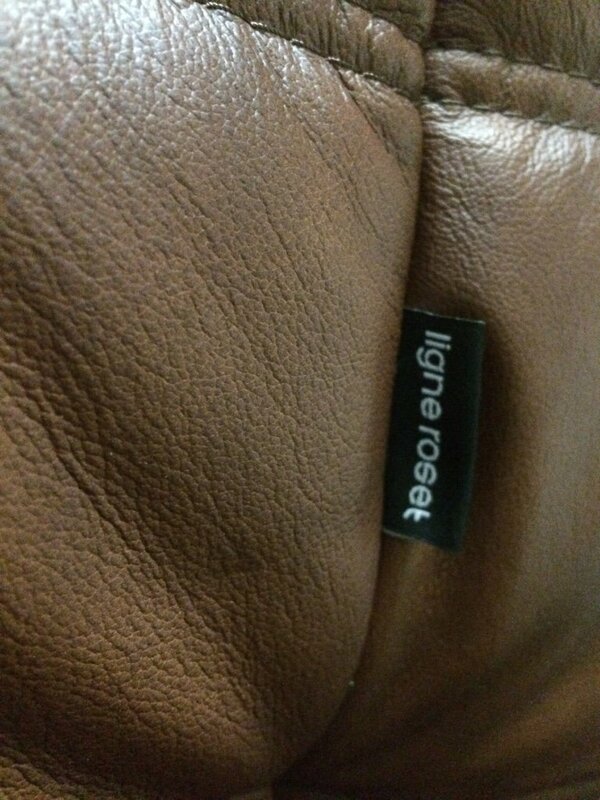 By the time Antoine passed away in 1893, Veuve A. Roset was dedicated exclusively to furniture production. 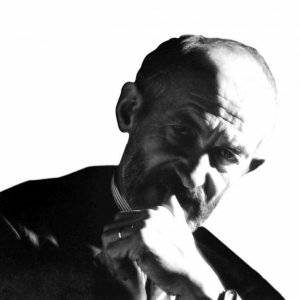 Antoine was succeeded first by his wife Marie-Victorine (1854- 1923), followed by his son Emile (1882-1946) in the 1910s. 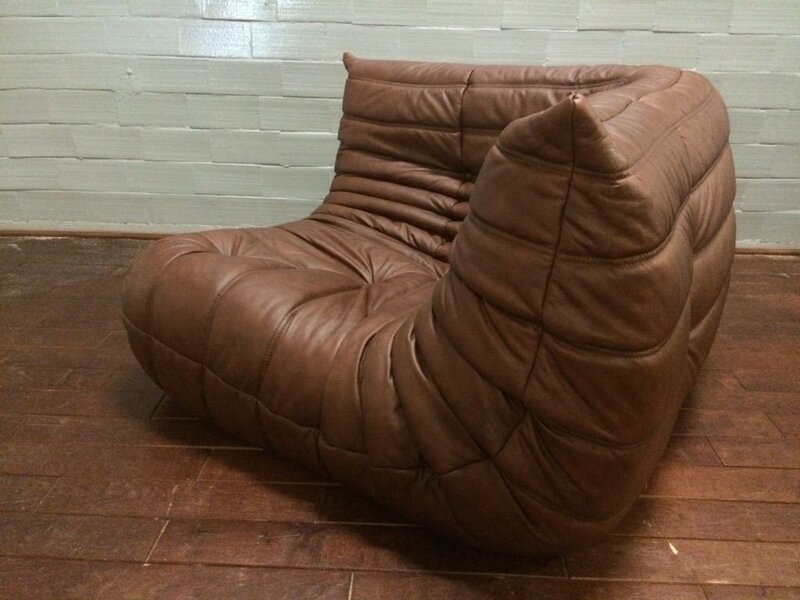 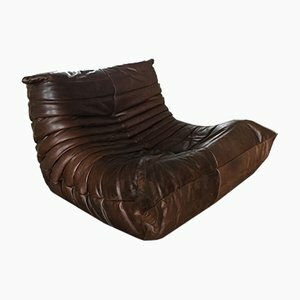 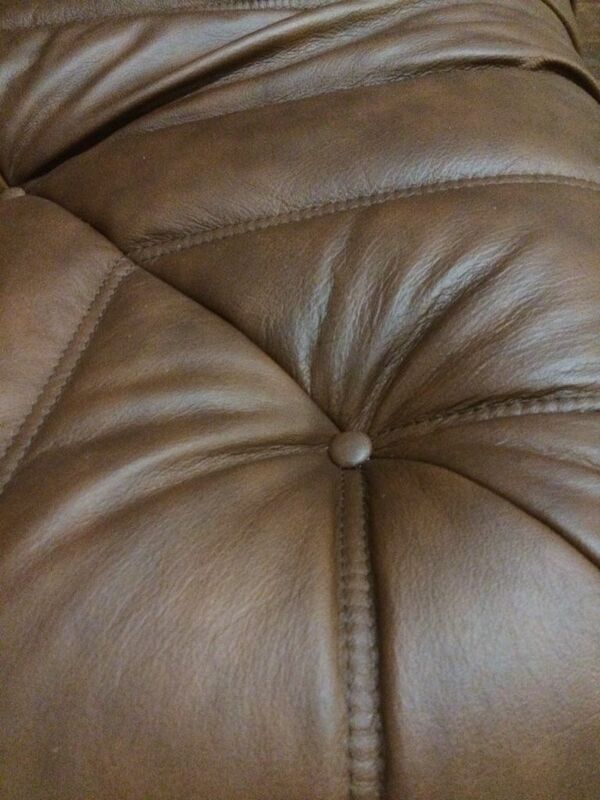 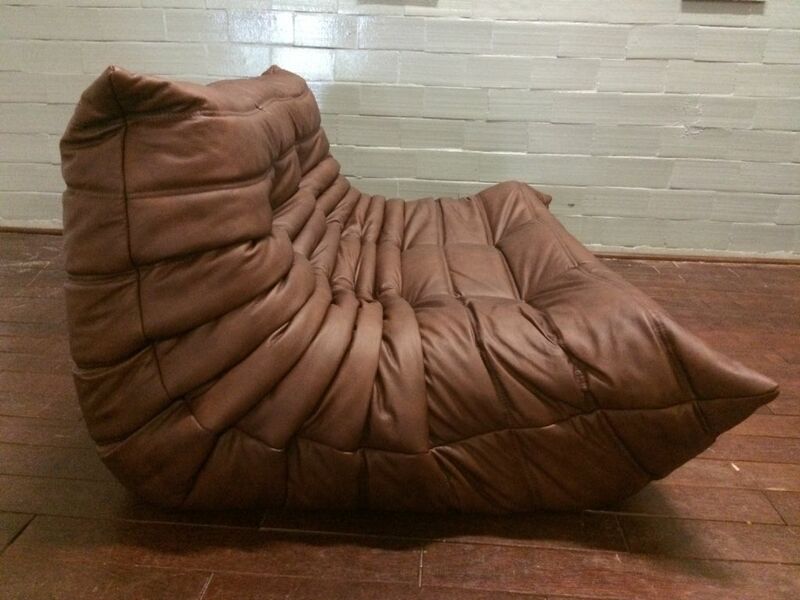 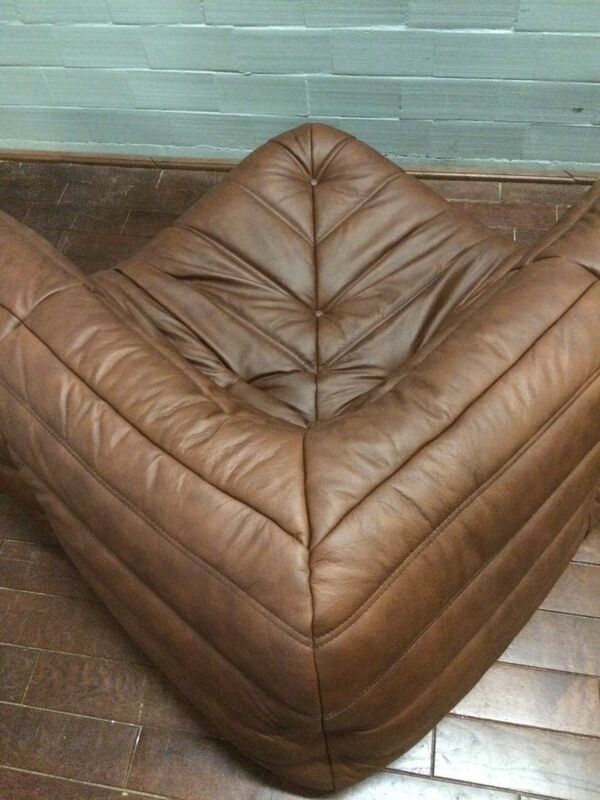 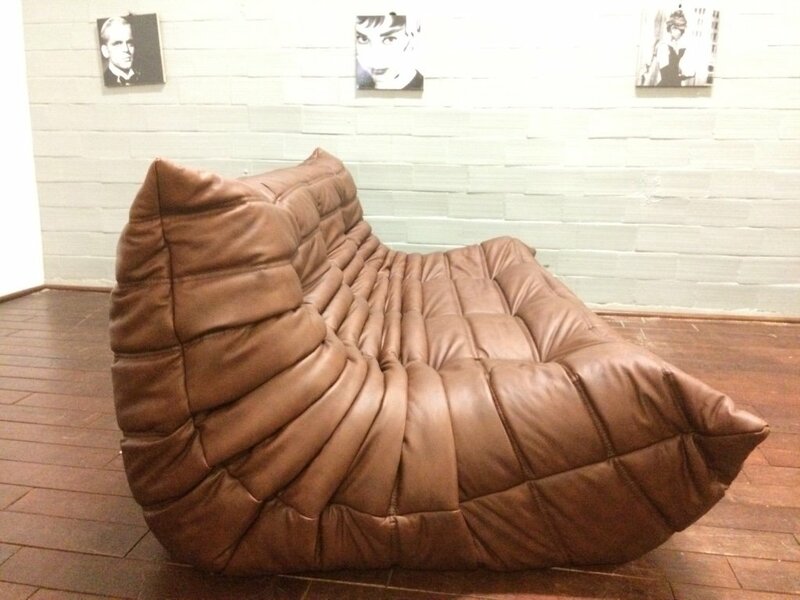 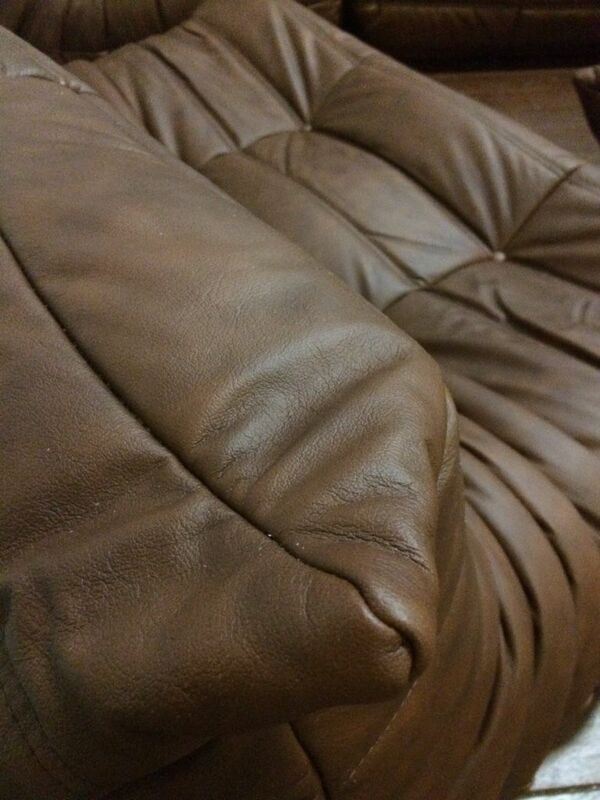 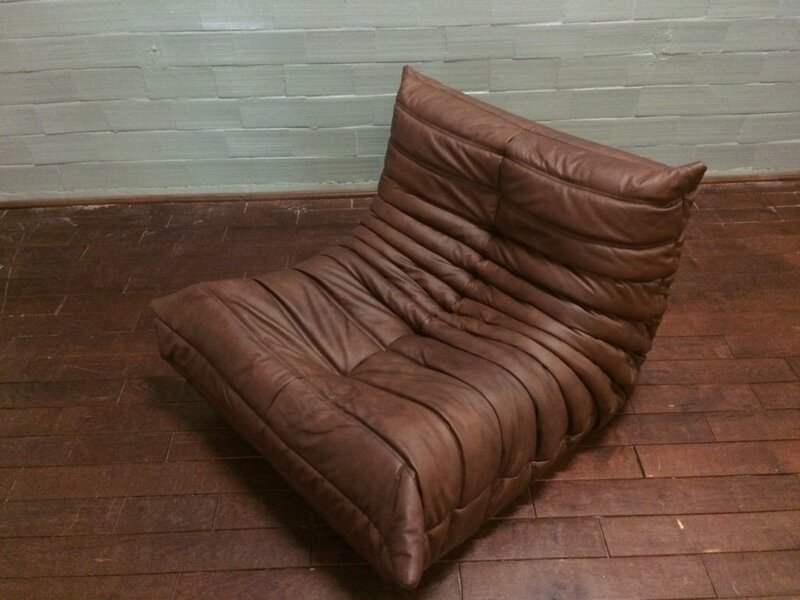 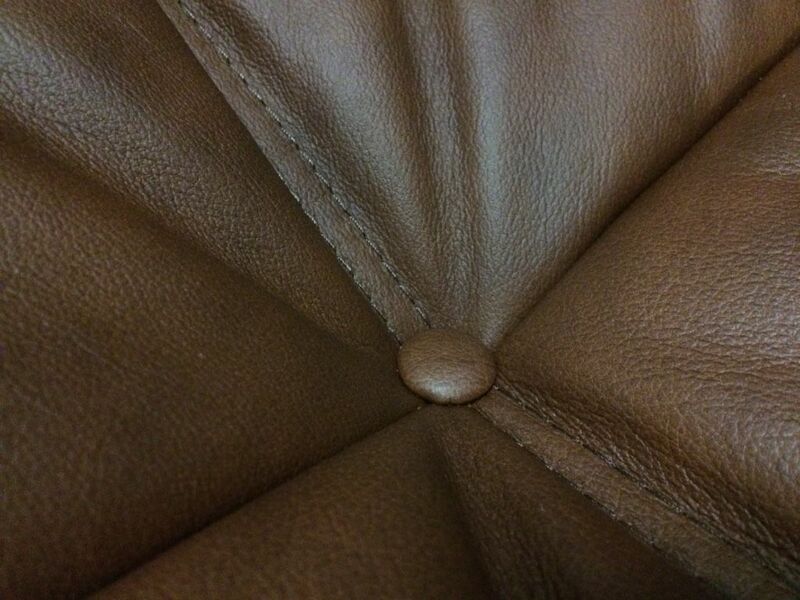 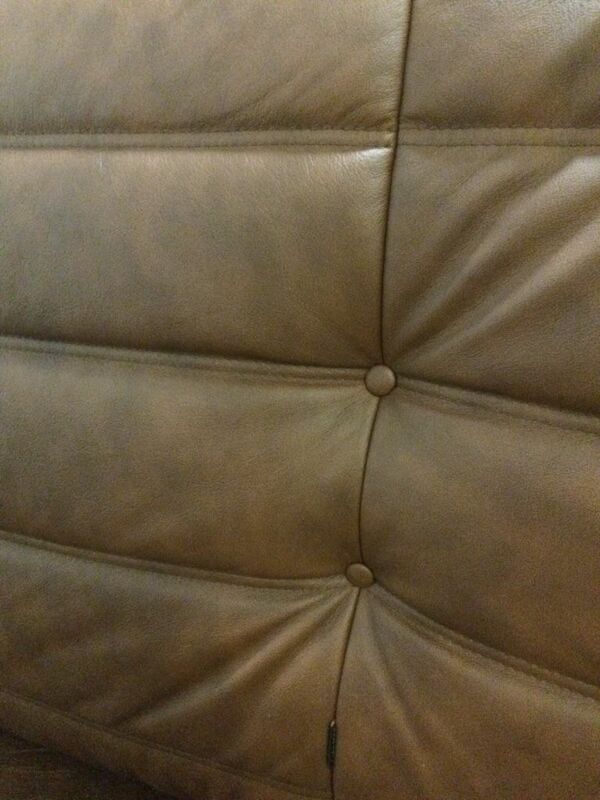 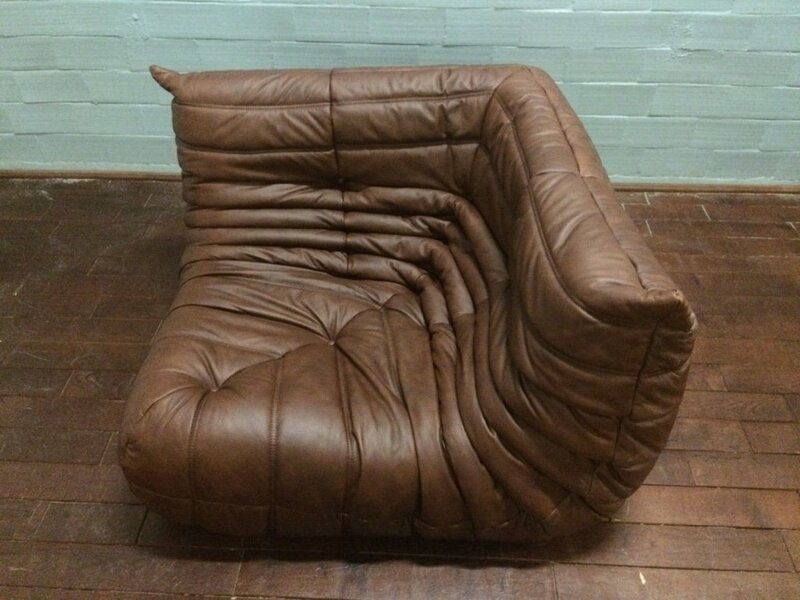 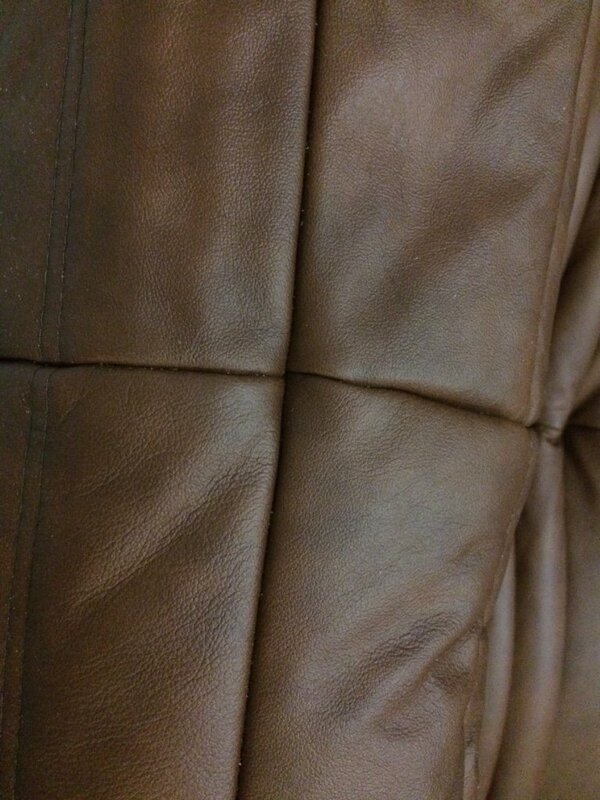 In 1936, Roset produced its first upholstered seats, mainly in leather. 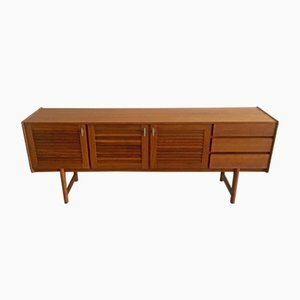 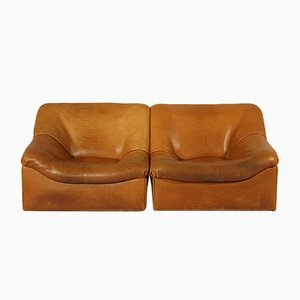 In 1946, the company passed to the 3rd generation, Jean Roset (1920-1999), who would play a key role in taking the Roset brand to international acclaim. 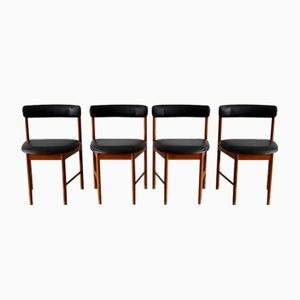 In the postwar years, Jean transformed the company to meet the demands of postwar reconstruction by redirecting production to the contract market—developing modern, Scandinavian-inspired furniture lines suited for use in schools, universities, hospitals, and other public spaces. 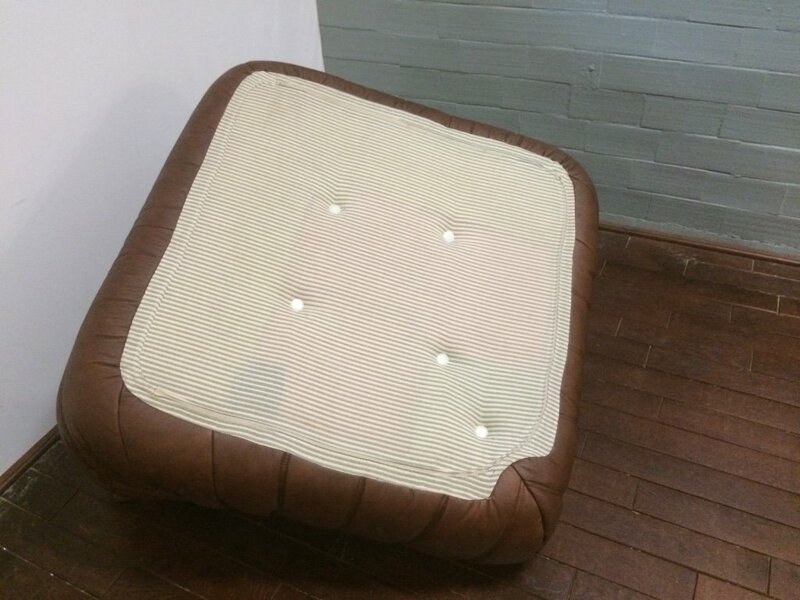 By the mid-1960s, the company was producing more experimental designs, often utilizing Dacron foam, aimed at the residential market. 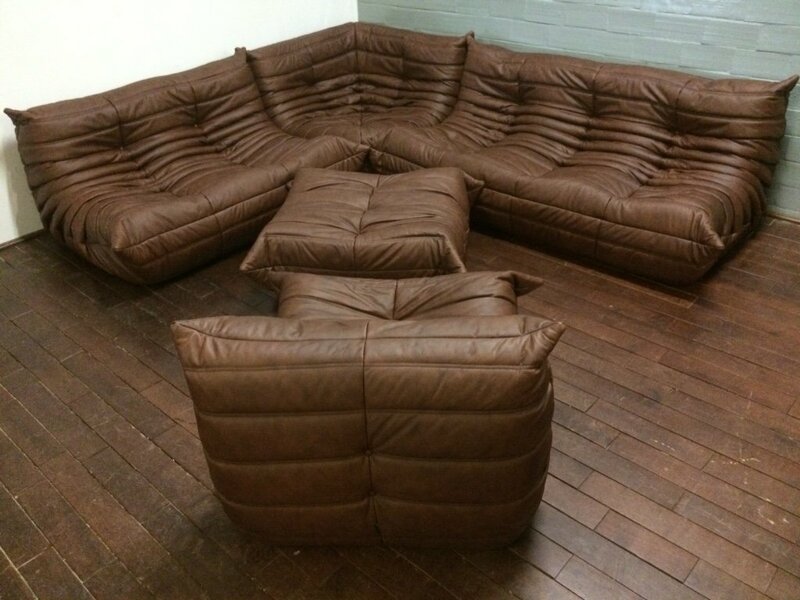 Examples include Bernard Govin's Asmara Modular Sofa (1966), as well as Michel Ducaroy's Adria Lounge (1968). 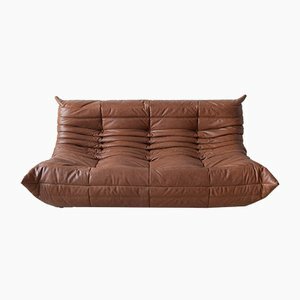 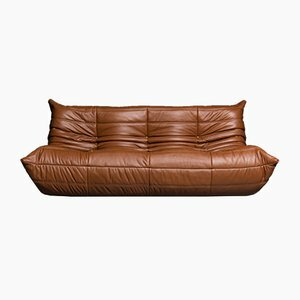 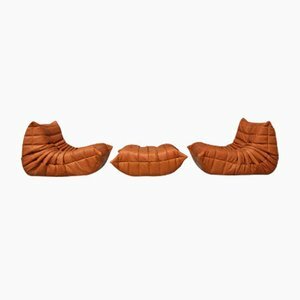 1973 was a big year for Roset: the company rebranded "Ligne Roset," the first branded retail spaces were opened, the iconic, pillow-like Togo Sofa by Michael Ducaroy was introduced. 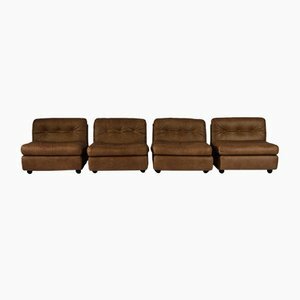 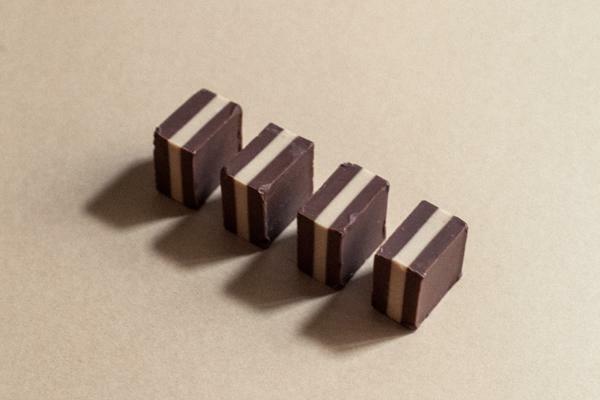 Around this time, the 4th generation of Rosets joined, Pierre and Michel, who run the company today. 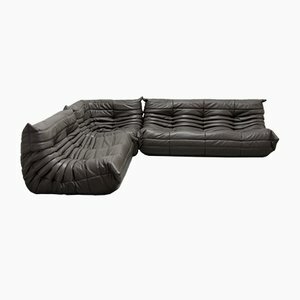 The company's reputation has only grown in the 21st century, due in large part to the highly editorial character of Ligne Roset's collections, such as the Zen Sofa by Claude Brisson (1986), Profile Sofa by Jean Nouvel (1988), Jean Charles Sofa by Jean-Charles de Castelbajac (1988), Facet Sofa by Ronan and Erwan Bouroullec (2005), Moel Sofa by Inga Sempé, and the Pumpkin Sofa originally design by Pierre Paulin in 1971 and put into production by Ligne Roset in 2008.